Nonverbal World - All about Nonverbal Communication: Learning micro expressions is really useful? For years, we have been hearing about the importance of micro expressions when it comes to recognizing emotions accurately. 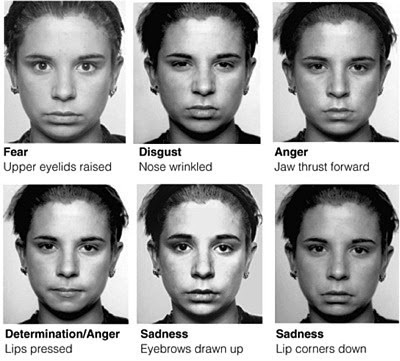 Ever since the 70's, Paul Ekman began his groundbreaking research in this area; there has been an intense debate about training and developing an ability to recognize micro expressions. Following several articles published in media emphasizing of micro expression training, there are many other that raised contradictions. Therefore, we now present a very interesting article. The research was conducted by two professors of social psychology namely Dr. David Matsumoto and Dr. Hwang Sung at the State University of San Francisco, United States of America. Another interesting factor was that the investigation by the university was funded through a grant from the Army Research Institute and the Office of Scientific Research of Air Force. This work is notable because it presents scientific evidence of the effectiveness of training to improve the ability of emotional recognition through micro expressions. In a first study, several people belonging to sales profession participated in a conference in which they were given basic knowledge on emotional recognition. These people were divided in two groups. One of them received an additional training session 60 minutes by a trainer experienced. This group was compared with the other one that received no additional training. The results showed an ability to recognize micro expressions significantly higher in the group of additional training in comparison with the other group. 1) Both groups were equivalent in their knowledge of emotions because both received basic information on emotional recognition. However, one group received additional training workshop and other did not. 2) The impact of the training program not only demonstrated in emotion recognition tasks but also produced significant social and communication according to an assessment by third participants two weeks after the program. The results of the "Study 1" were further reinforced by the results of the "Study 2" that demonstrated the effectiveness of the training program after a period of time after training. In Study 2, participating lawyers and psychologists split into created two groups. First group received training in recognition of micro expressions and another did not. Three weeks later, a test was conducted for trained group and untrained group for comparison. The trained group was significantly better in emotional recognition than the other. Moreover, they responded to emotions faster i.e. response time (latency). These findings are important because they show that people can be trained in recognizing micro expressions and also same capacity can be retained over time. The authors says in their conclusion that that the scientific evidence presented in these studies provided the evidence necessary for those interested in understanding the emotions of their partners. If you interact daily with other people and want to understand them better, training in recognizing micro expressions is a very interesting option to consider. Undoubtedly, this research was very important in international scientific community.